It's been a while since I've done small daily paintings and I couldn't resist beginning them again. 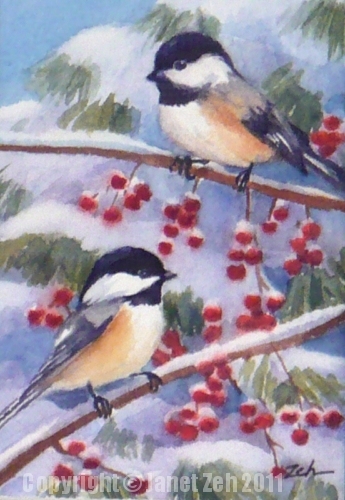 Here is my first one for 2011 inspired by a couple of sweet little chickadees outside my studio window. They appreciate the black oil sunflower seeds in the birdfeeder. I don't think they eat anything else. They'll pick through the seeds until they find one, then fly off to a branch to peck it open, eat the meat, then wait for their turn to get back to the feeder again.